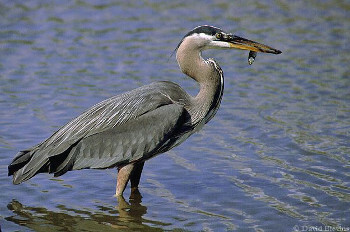 Breeding Habitat: Marshes, swamps, tidal flats, shallow coastal bays; shores of ponds, lakes, and rivers. Prefers habitats that include tall trees for nesting. Diet: Mostly fish; also frogs, salamanders, lizards, crayfish, snakes, crustaceans, aquatic and terrestrial insects. Some small birds and small mammals (such as rodents). Habitat, diet, feeding behavior, nesting, migration, and conservation status of this bird. Includes range map, photos, and songs and calls.